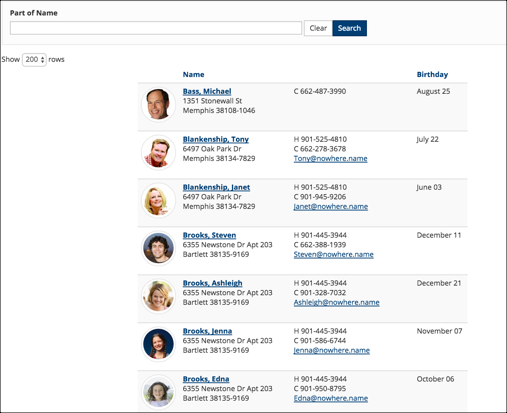 This feature allows a church to create an online directory with photos, contact information, and date of birth (month/day only). The Main Directory – This will be located at the URL mychurch.tpsdb.com/PictureDirectory. The Main Directory requires a Setting called PictureDirectorySelector which points to a Status Flag or an organization. A church may have only one Main directory. Specific Directories – This directory will point to an Organization or a Division with multiple organizations. The URL will be mychurch.tpsdb.com/PictureDirectory/id where id is either an OrganizationId or a DivisionId prefixed with the letter d (e.g. PictureDirectory/d205). A church can have many of these type of directories. Create a Search Builder search for all Members of the church and whatever other conditions you want. Create a Status Flag by saving the search as F99:Picture Directory (or use a different Status Flag if that one is used already). Go to Administration > Setup > Settings and click Add Setting and name it PictureDirectorySelector. Now edit that setting to be F99 or whatever status flag you used. View your directory at https:// yourchurch .tpsdb.com/PictureDirectory. where yourchurch is your church domain. Go to an organization with members. View your directory at https:// yourchurch .tpsdb.com/PictureDirectory/ id where yourchurch is your church domain, and id is the Organization id. You can opt out any member of an organization’s Picture Directory by adding them to a sub-group called DoNotPublish . Only those who are displayed in the directory as part of the group can view the directory. If the person has opted out from the directory they will not be able to view it either. Additionally, the person must be log in to view this directory. Exception: An Admin user can view any online directory without being in the directory. And the Admin role is required to set up this directory. 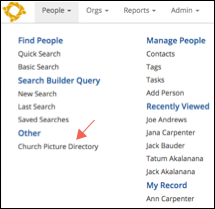 If you use the PictureDirectorySelector Setting, you can access the directory on the home page of the church’s TouchPoint database under the People heading in the main menu. You can search by part or all of a name by entering it in the text box labeled Part of Name and pressing Search or by hitting Enter on your keyboard. Only those matching the text you entered will be displayed. Press the Clear button to return to the full directory after searching or to return to the normal sort order after changing the sort. All families are kept together even if the last names are different. The default sort is by last name, first name of the Head of Household with his/her family members listed below that name. If you sort by the Birthday header and want to return to the default sort, click the Name header. If your church is displaying the date of birth, you can click the Birthday heading to sort by the month and day to find those with upcoming birthdays. If will not sort starting with January, but by anyone who has a birthday on the current day or later. This is designed to help you acknowledge someone’s birthday, not to compile a birthday list. Small images of the person’s individual photo will display. Click the image to view the full version. Click again to return. The email link will be active only if the person viewing the directory has access to view that person’s record, either as an Org Leader user or as a staff member. Clicking it will open an email in that person’s default email client. The person link (the person’s name) will be active only if the person viewing the directory has access to view that person’s record, either as an Org Leader user or as a staff member. Clicking the link will open that person’s people record in a new tab.